Children attending P.S. 216 in Gravesend, Brooklyn don’t have to stomach pink slime mystery meat or nasty school lunches. Instead they regularly feast on meals from their school garden. 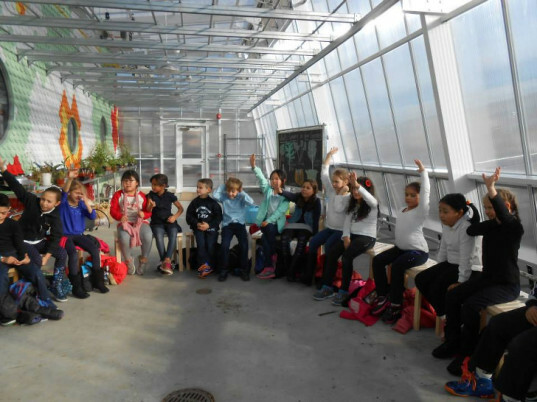 Thanks to a talented team of architects at WORKac who transformed a defunct parking lot into a half-acre indoor-outdoor classroom, students at P.S. 216 are getting hands-on lessons in sustainability and urban agriculture. With year-round access to fresh foods and a curriculum that lets them taste their homework, chances are, kids attending this elementary school won’t be asking mom or dad to stay home sick anytime soon. 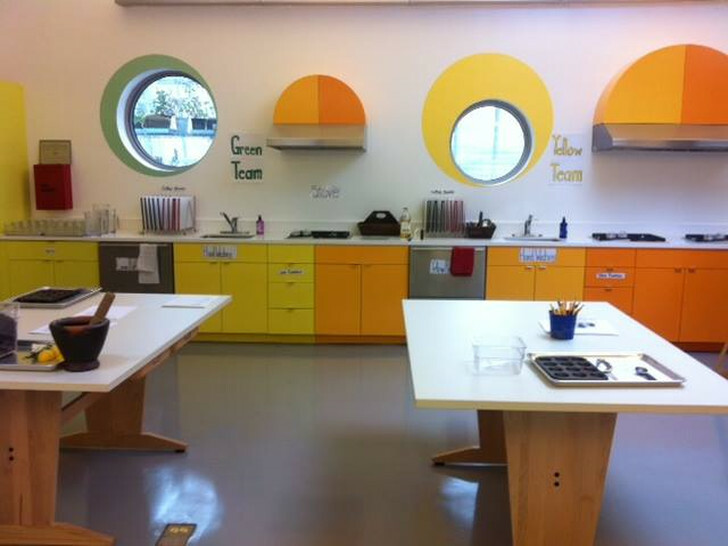 The 2,300 square-foot building rests adjacent to the school’s main building boasting a Kitchen Classroom, a greenhouse and a “Systems Wall” that lets students witness the conservation of rainwater in action. 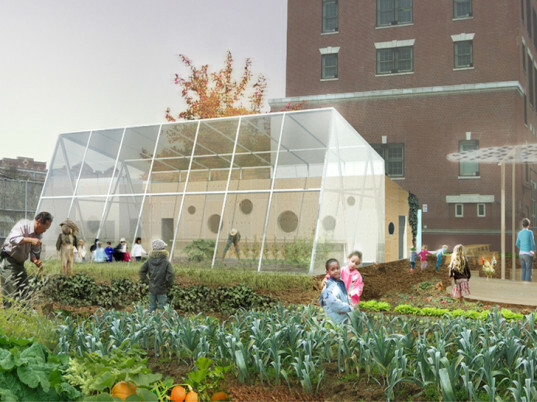 The first of its kind in New York, the new Edible Schoolyard boasts several sustainable attributes including: a 1,550-gallon rainwater collecting cistern, a compost processing station, a chicken coop and an off-grid infrastructure for sorting waste. Students take up to four classes in the Edible Schoolyard each month alternating between indoor cooking sessions and outdoor planting/picking. The project got its start in 2010 through the efforts of Edible Schoolyard NY who teamed up with WORKac to bring the idea to life. Edible Schoolyard is an organization that partners with public schools to provide gardening and cooking schools with the goal of increasing the knowledge, skills and environment required to help students make healthier choices and change the way they eat for life. With plans to expand the program throughout the five boroughs, WORKac is in the process of constructing the second project at P.S. 7 in Harlem. Designed to maximize the harvesting of rainwater, the building’s shape is a hallmark of architecture made-to-play featuring a series of different materials: the greenhouse is constructed from polycarbonate and aluminum structure, the steel framed kitchen classroom is tiled with shingles in playful flower patterns, and the systems wall is coated in a bright blue that draws in students upon their immediate entrance into the building. See more of the Edible Schoolyard project in action here. Children attending P.S. 216 in Gravesend, Brooklyn don't have to stomach pink slime mystery meat or nasty school lunches. Instead they regularly feast on meals from their school garden. Thanks to a talented team of architects at WORKac who transformed a defunct parking lot into a half-acre indoor-outdoor classroom, students at P.S. 216 are getting hands-on lessons in sustainability and urban agriculture. With year-round access to fresh foods and a curriculum that lets them taste their homework, chances are, kids attending this elementary school won�t be asking mom or dad to stay home sick anytime soon.